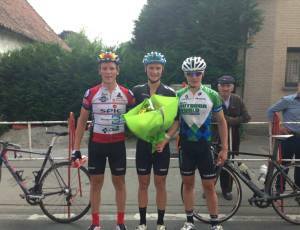 BikeNZ's Junior Worlds endurance riders showed their form over the weekend with a brilliant trifecta to dominate the podium and scoop the first three places in the Dentergem Kermesse in Belgium. The trio of Regan Gough and Cycling Southland's Liam Aitcheson and Josh Haggerty claimed podium finshes in the 87 kilometre event, ahead of the 70-plus field. Aitcheson, a silver medalist at last year's UCI Juniors Track World Championships in Invercargill, returns to the event to be held at Sir Chris Hoy Velodrome in Glasgow from August 7th to 11th and is joined in the nine-strong all-male squad by Invercargill debutant Haggerty and Gough, who impressed in winning the under-19 omnium in his first year in the category at the Age Group Championships earlier this year.